The D.Heritage cabinet is an elegant décor piece to compliment the decoration of any interior setting. It takes you on a small journey through the Portuguese history and culture. 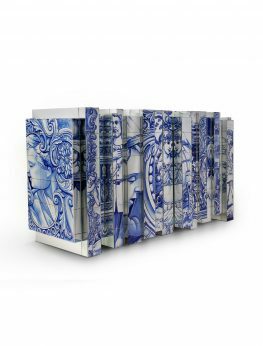 Covered in Azulejos, the Portuguese traditional hand painted tiles, this piece tells tales of the county’s maritime discoveries and expansion. 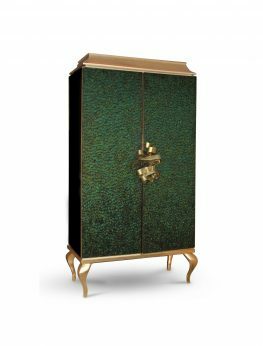 The D.Heritage cabinet has a strong luxury appeal and demonstrates the talent and craftsmanship that is poured into this object. 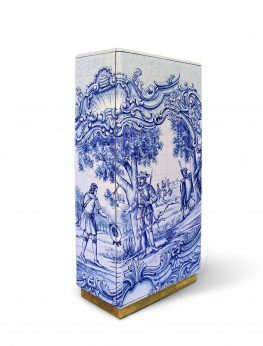 This noble cabinet draws inspirations from the legacy of the Portuguese King Manuel, its aesthetics and style, and pays a tribute to Portugal’s most influential epochs. This one of a kind cabinet features a range of unique finishes and remarkable design elements, inspired in the classic Manueline style. 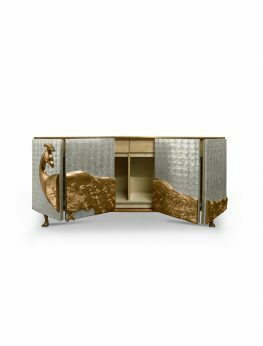 This extraordinary Diamond Sideboard is a reflection of meticulous craftsmanship, incredible techniques and expertise; undoubtedly deserving its title. 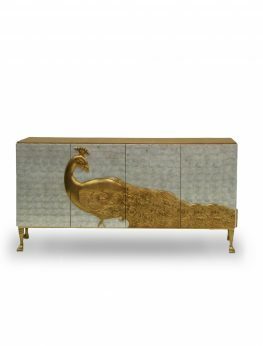 This opulent object has two carefully sculpted doors that reveal a gold lined interior with shelves and two drawers. 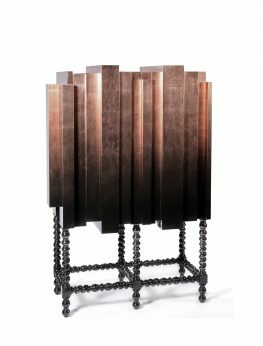 This piece is inspired by the gothic furniture, as well as the power of imagination, which both take its unique character to the next level. 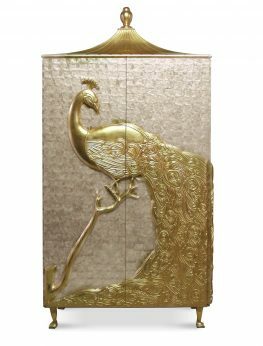 This exceptionally desirable double door pagoda top armoire is covered in delicate iridescent peacock feathers, each individually placed. An exquisite metal ribbon opens the doors to a lavish interior graced with four antique mirror drawers and two adjustable glass shelves. 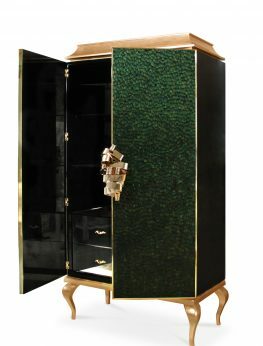 Body finished in high gloss black lacquer, peacock feather covered doors, and base and top covered in gold leaf. This piece is absolutely lavish and exquisite. 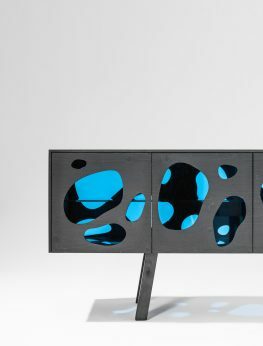 Signed by Cristian Zuzunaga (Barcelona, 1978), this beautiful cabinet is designed by an atypical artist with a graphic art profile having a language of it’s own. 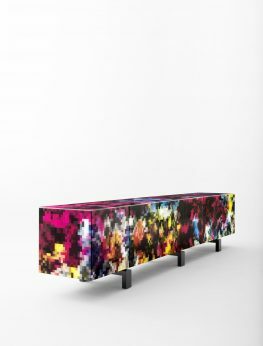 Pixels being a part of his designs have given him fame and international recognition. He has said that his style is fruit to a dream he had, which is precisely the name given to this piece: Dreams. 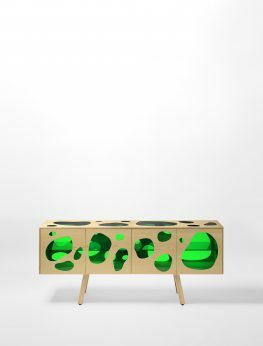 The cabinet is presented in three versions. A coloured one, black and or white. The Heritage cabinet is an elegant décor piece to compliment the decoration of any interior setting. It takes you on a small journey through the Portuguese history and culture. 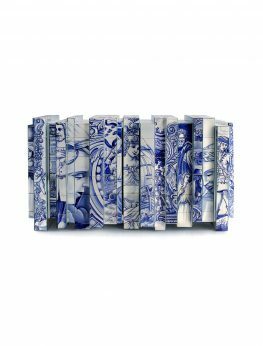 Covered in Azulejos, the Portuguese traditional hand painted tiles, this piece tells tales of the county’s maritime discoveries and expansion. 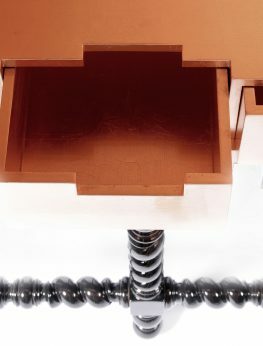 The Heritage cabinet has a strong luxury appeal and demonstrates the talent and craftsmanship that is poured into this object. 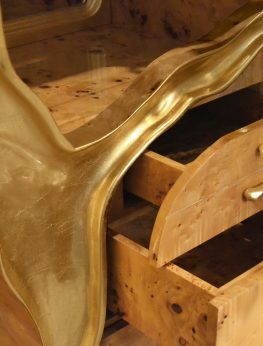 In its interior, there is one door and four drawers, fully lined with golden leaf. 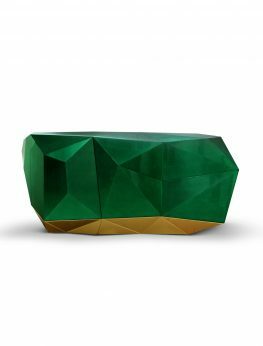 The Heritage Sideboard is small journey through Portuguese history and culture. 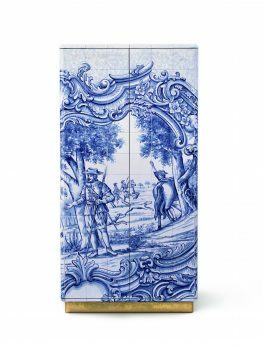 Covered in Azulejos, the Portuguese traditional hand painted tiles, this piece tells tales of the county’s maritime discoveries and expansion. The Heritage sideboard has a strong luxury appeal and demonstrates the talent and craftsmanship that is poured into this object. The sideboard lined with hand painted tiles. 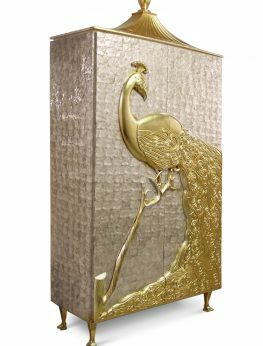 Inside, there is one door and four drawers fully lined with gold leaf. 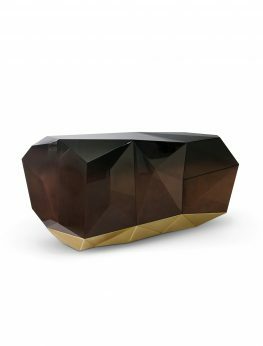 Contains two shelves made in bronze glass. 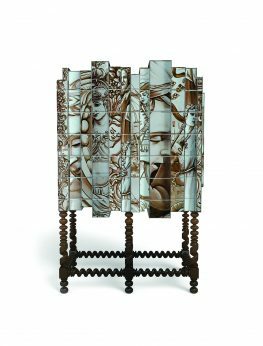 The Lapiaz cabinet draws inspiration from the the patterns created on limestone or dolomite rock due to freezing temperatures. 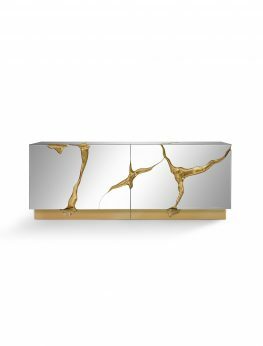 Much like this geological phenomenon, the Lapiaz cabinet is split in a unique shape, revealing the beautiful, rich and alluring interior. 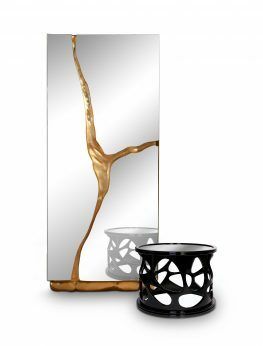 Produced using the finest veneers, gold leaf and hand-cut mirrors, the Lapiaz brings bold character to any interior, while maintaining a refined and elegant posture. 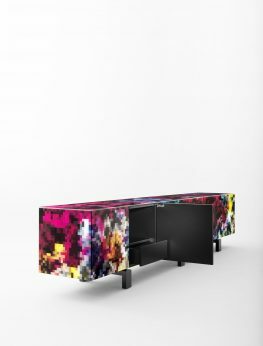 The Lapiaz Sideboard takes exceptional craftsmanship and design to a new realm. Consisting of two individual modules, the Lapiaz is finished in polished stainless steel with a poplar root wood veneer interior. This piece is truly mesmerizing; it combines an organic, raw form with a genius of design and artisan skills.